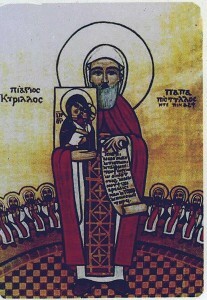 ST. CYRIL became Patriarch of Alexandria in 412. Having at first thrown himself with ardor into the party politics of the place, God called him to a nobler conflict. In 428, Nestorius, Bishop of Constantinople, began to deny the unity of Person in Christ, and to refuse to the Blessed Virgin the title of “Mother of God.” He was strongly supported by disciples and friends throughout the East. As the assertion of the divine maternity of Our Lady was necessary to the integrity of the doctrine of the Incarnation, so, with St. Cyril, devotion to the Mother was the necessary complement of his devotion to the Son. St. Cyril, after expostulating in vain, accused Nestorius to Pope Celestine. The Pope commanded retraction, under pain of separation from the Church, and intrusted St. Cyril with the conduct of the proceedings. The appointed day, June 7, 431, found Nestorius and Cyril at Ephesus, with over 200 bishops. After waiting twelve days in vain for the Syrian bishops, the council with Cyril tried Nestorius, and deposed him from his see. Upon this the Syrians and Nestorians excommunicated St. Cyril, and complained of him to the emperor as a peace-breaker. Imprisoned and threatened with banishment, the Saint rejoiced to confess Christ by suffering. In time it was recognized that St. Cyril was right, and with him the Church triumphed. 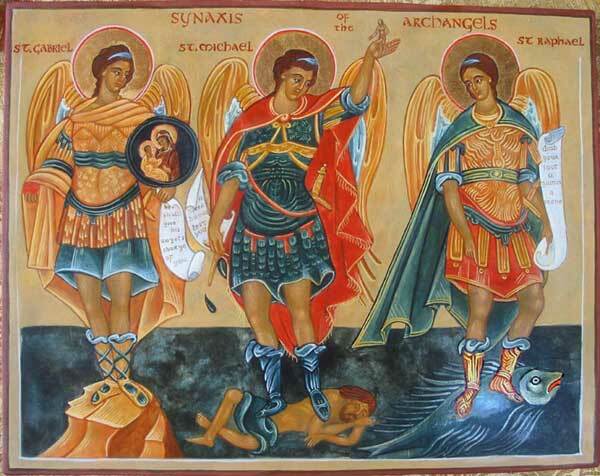 Forgetting his wrongs, and careless of controversial punctilio, Cyril then reconciled himself with all who would consent to hold the doctrine of the Incarnation intact. He died in 444. Reflection.—The Incarnation is the mystery of God’s dwelling within us, and therefore should be the dearest object of our contemplation. It was the passion of St. Cyril’s life; for it he underwent toil and persecution, and willingly sacrificed credit and friends.